The Series 9000 is the candidate of choice whenever accurate, reliable total hydrocarbon analysis is required. 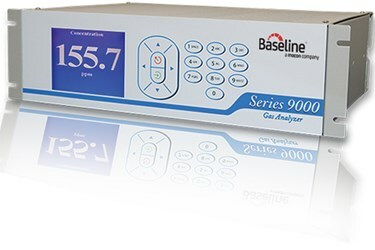 Series 9000 analyzer provides unparalleled flexibility and offers continuous, fully automated gas analysis over a broad range of concentrations. With an incredible dynamic range from less than 10 ppb on the low range version and up to 100% as methane on the high range version. The analyzer has a generous complement of analog, digital and logic output capabilities. These features place the instrument well ahead of the competition in performance, automation, and configurability. The analyzer is based on a FlowGuard electronically controlled flame ionization detector (FID) that delivers a small portion of the sample gas to the detector flame. During the combustion process, organic or hydrocarbon-based gases in the sample are ionized to a point where they can be detected by the instrument and reported as a concentration. The Model 9000 can be configured with internal components for a single or multipoint analysis of non-condensing gas samples. The automatic calibration feature enhances the long-term analytical stability of the instrument.